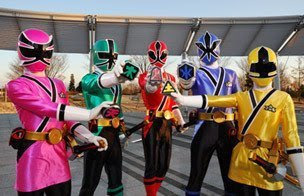 The Shinkenger cast performed a live show like most 2000s sentai as a promotion. Here are some pictures taken. I found these pictures while googling like crazy. In a classy swimsuit. This was one of the best pictures in the 80s sentai. Actually Dekaranger seems to have another interesting romance. From the official timeline, they have become a couple and it seems to be what I would say is that it's probably an unexplored potential WAAAAAAY back in the past (say Green 2 and Pink 5) that is finally brought to fruitation. Well they didn't really date at first since in episode two, Sen was dating some office girl that both Ban and Hoji fought for. 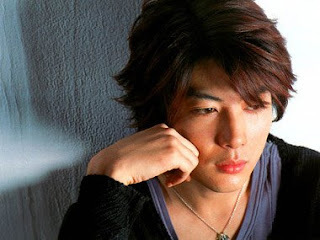 But as much as the series came, the two started to become an item sooner or later but it was in episode 46 when a false suitor came to Umeko that Sen's real feelings started to pour out for her. That false suitor was none other than an Alienizer named "Matthew" but whatever his real name was never mentioned. He was a criminal who got widowed 273 times because he killed all his brides. This really made Sen angry and so did Umeko that they worked as a team to defeat him for good. At the end of the episode, the two admitted their feelings. Super Sentai later introduced the concept of a self-operating robot, one without a pilot. Here are the most significant ones. Tetraboy from Jetman was the first AI robot. It converted into a giant bazooka for either Jet Icarus or Jet Garuda to fire. The concept was put into Jetman during the Ashu crisis. King Brachion of Zyuranger is more than a fortress mecha because it had a will of its own and had no pilot. It was the first to also combine for the ultimate combination. And so is Daimugen who has a human form. Tsubamaru is the first one to combine with the primary robots directly. The concept was re-used in Gogo V and Timeranger. Tackleboy is the smallest AI mecha. I personally thought the Ohrangers can take advantage of his size to beat out Tetraboy in a battle. Ginga Phoenix is the first AI mecha that composes of five pieces. Ginga Rhino is the second AI mecha to be composed of five pieces. Super sentai used to have those flying fortresses but they were later replaced by fortress robots which were present in some sentai. The homebase of the Turborangers- the Turbo Builder has a robot mode itself. 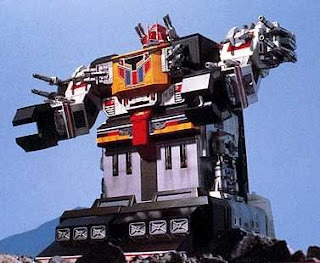 It can combine with the Super Turbo Robot thus the first "Ultrazord" which was used to defeat an enlarged Ragorn. Its first appearance was when it defeated Zimba when the Turbo Robot was defeated. The Magmabase in Fiveman. It combined with the Super Five Robo to form the Max Magma. Also, it was the first to be able to move around and be destroyed in the final battle. Kyukyoku Daizyujin. This awesome combination was first used when Dai Satan was first summoned by Bandora on Earth via the Satan Tower. Titanboy- the very first secondary robot. Galaxy Robo from Maskman is the first secondary robot to somewhat have sentience and be a transforming one. It also killed its own pilot while on test drive. The first secondary robot to be used by two additional members, a gattai one (which I will also make an entry on secondary gattai robots). Star Five was the first sibling based secondary robot. Bird Garuda was the first alien-based secondary robot to combine with an Earth-based primary robot. Zyuranger's Dragon Caesar is the first secondary robot that would combine with three of the other mecha and is piloted by the sixth ranger instead of the entire team. Won Tiger was the first secondary robot to be piloted by a child.